Rock Star Knitting – Page 2 – I knit, therefore I rock. So, lately I have been knitting stuffed toys from Knit Animals Friends by Annie’s, and I’m doing finishing work on a bunny and am working on a dog as a follow up. The photo at the top is where I left off with the bunny. He’s taking shape! I decided to knit toys because I came across the pamphlet of patterns that I had purchased a while ago. And, I had poly fill, but apparently not enough for Mr. Incomplete Bunny up there. It’s been fun to knit these toys. Each animal starts off with a basic shape and basic sweater. All of them have similar finishing, but embellishments, ears, noses, and muzzles make them different animals. It’s a neat ideas and very smart. I’ve had to keep an especially hard eye on Sputnik when working on the stuffed toy because he thinks all stuffed animals are his to destroy. Silly doggo. If you are interested in purchasing the pattern, you can get it for Kindle. Click on the affiliate link below if you are interested. It finally happened. Sputnik, my almost nine month old puppy, got into my one knitting storage chest and got at a skein of Lopi Einband yarn that I needed to use on my Faroese shawl that I work from time to time. Bad dog. I can understand why Sputnik went after it: it’s wool! It smells like an animal. Luckily, and surprisingly, he left the actual project alone. I’m thankful for that. It’s one of those crazy situations that you have laugh, really. Still, I’m not amused. I think the skein is salvageable. I still have it and put it in a sealing freezer storage bag, and away from the dog. I’ll have to take a look at it when he’s not looking. Stitch Mountain: 30 Warm Knits for Conquering the Cold by by Laura Zander is a cool book. I got it in one of the fun bookstores in the Outer Banks, NC, USA a few years ago. I saw the Snowflake Turtleneck pattern in there and knit it, and TOTALLY messed it up. I think I botched the shoulder shaping. I dissected the completed faulty sweater the other day, and that’s what I think. I never did write a post about its completion because I was too ashamed and frustrated from having a messed up sweater. After analyzing that sweater, I decided to give it another go. I cast on with a creamy white worsted yarn that I had left over from another project, and there’s plenty of it for a nice sweater. It took three tries to get there right gauge, but I did, so I know at least that correct! So, here’s to giving it another go, and hopefully I can show off a completed sweater before the weather gets warm again. I’m being cautiously optimistic that I will have a correct fitting sweater this time, too! My friend Mary is an art teacher, and is currently working with students at the Quarryville Public Library in Quarryville, PA, USA by having them create ATC’s, which is sort for artist trading cards. Artists and members of community are being encouraged to create ATC’s themselves, and to send the cards to the library, and, in return, you’ll get cards back for the kids. It’s a great way to encourage and interact with kids through art! Learn more about this great program over on my artist page on Facebook. Don’t hesitate to participate! I sent in five cards, and if return, I received five back. Top image was created by Frances N., and is titled “Do What You Want After All You Choose :). The smiley face is included in the title she wrote on the back of the card. I love it! Here are the other cards. I really like them! It’s great to see the creativity and thought process kids and other artists have with these ATC’s. I love these, right down to the titles. Thanks, Quarryville Public Library! ATC’s aren’t hard to do, really. Follow the instructions in the article to find out how to make your own. You can also buy ATC sized paper at craft and art stores. Get busy and start creating! 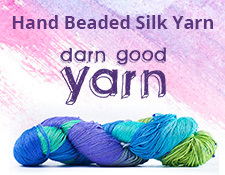 For those fiber artists out there, think outside the box. All that scrap yarn from woven ends and tangled messes? Cut it up and think of what you can do with that! Add some glitter paint, and you have some pretty cool art.